The game: Bouwradius – Veiligheid op de werkplaats ( safety on the workplace ) was designed and produced for Bouwradius, a company dedicated to training personel for the building sector. Again, this educational game was designed as a cooperative experience (all the players work together against the game-system). 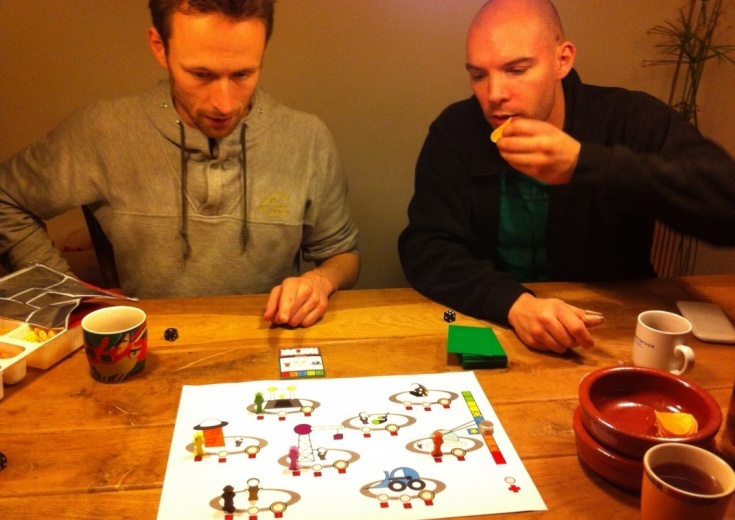 Cooperative games invite the players to discuss the current situation on the game board and triggers them to come up with the best solution, inside the game space and out. – The timepressure workers feel to complete assignments, at the cost of safety. – The office vs. the workspace. Many workers feel that management has too little empathy with the people executing their assignments – Workers do have influence if they speak out about the daily issues they face – Pointing out dangerous working methods to a fellow worker is a good thing, not a form of disrespect. – Everyone is responsible for each other. – Accidents are usually the result of a compilation of small missteps, not simple bad luck. Bouwradius, the game, takes advantage of giving the players a birds-eye view of a situation most are usually smack in the middle of. Discussing the problems and relating them to their every day lives is another step closer to less accidents in the field.